India Hicks has lived a fascinating life and now her collection of original accessories, and more, is available in the most fascinating way -- presented and sold by women all over the world. In 2015, India Hicks who is an energetic and beautiful 51 years young, founded her eponymous lifestyle brand, which is not available in stores but instead is sold online and through her entrepreneurial brand Ambassadors, who sell the collection all over the America. Chatting with India is always interesting beacause her world has been coloured in the most fascinating ways. Give us an overview of your career. After graduating from the New England School of Photography, I lived between New York, Paris, and London, modeling for Ralph Lauren and others, including some really dodgy German catalogues throughout the 1980s and 1990s. Somewhere along the way, I found myself on Harbour Island, Bahamas, where I fell in love with a man and a gentler way of life. This became home, where we have raised our five children, renovated a hotel, designed several houses and kept busy hosting television programs on networks from Bravo to the BBC. I’ve written four books; Island Life, Island Beauty, Island Style, and A Slice of England and partnered with well-known global companies to design collections. By then it was time to put my name of something of my own – not a license, not a collaboration, and so began hatching India Hicks London – Harbour Island, which we launched in January 2015. I have a weird notion about mostly neutrals with bursts of color and I like timeless pieces you don’t see coming and going, although I also pop into Zara when I can. Does your home style vary from your fashion style? If so, how? It’s quite similar, actually. We like a neutral palette. No David Hicks vibrating rooms for us, just pops of color. What are some of your favorite new things coming from India Hicks? From the Holiday Collection, our Zodiac Scarf can be worn in a million ways and looks fantastic on everyone – women, men, and dogs. 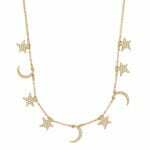 I’ve been wearing our vintage-inspired Twilight Necklace quite a bit. 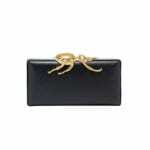 The Amulet Minaudiere is really cool with our good luck beetle big, bold and sculptural. When and how did you decide to start India Hicks? What was the hardest thing about it? Traditional retail didn’t seem quite right. I didn’t want the collection sitting cold on shelves. Creating a more meaningful shopping experience in the heart of the home felt fresh and exciting. When we started I worried about the collection. That soon turned to thinking about our Ambassadors and supporting them in their entrepreneurial experience. Extraordinary individuals, mostly. Always a touch of British heritage and a fresh perspective on island life informs everything we do. What was it like being one of Princess Diana’s bridesmaids? The morning of the wedding we greeted a fresh-faced Diana, who was dressed in old jeans with a diamond tiara on top of her head at Clarence House, the London residence of the Queen Mother. Diana was amused to watch herself on a tiny television screen that had been found in the nursery; she would flick away anyone who got in the way. During a commercial break, the advert for Cornett ice cream came on and she started singing. Soon we all joined in. ‘Just one Cornneeeettttoooo’ could be heard from the top floor. I clearly remember the moment Diana appeared at the top of the staircase. Everyone fell silent. The bride was radiant and ready to become the most famous of princesses. You grew up in England but are now living on an island. Is it as idyllic as it sounds? I’m practically Bahamian at this point but living on an island is different from being on holiday. The electricity goes out a lot and if the boat doesn’t show up there’s no milk. There is no doctor, dentist or vet…we go to other islands to find those or have to wait several weeks to catch a visiting one, we have a 4 month hurricane period and schooling can be a challenge. Island life is not as simple or idyllic as it appears. The pink sand and sunsets do make up for a lot though. At In the Groove, we are trying to disrupt the conversation around aging. How do you think we can do that? Getting older is a privilege and second (or third) acts can be truly brilliant. I really like to discover stories about women who finally make a leap into doing something for themselves after being defined by being a daughter, mother, sister or wife. Keep reminding readers that you can be all those things as well as being an artist or entrepreneur and at any age. Our tree is a real fir that travels by boat and is very thirsty by the time it finally settles in our Bahamian sitting room. On Christmas eve we gather around the fireplace, which we light, even if its boiling hot, just so we feel English-y and Christmas-y, and we hang the stockings, which were made for each of my children by my mother’s dressmaker, with their names stitched on in bold lettering. At 10:00 p.m. David and I go to Midnight Mass, yes you read that correctly. We always use the pretty ceramic plates David once gave me; they have charming Christmas trees painted on them. We always have Christmas crackers, we always wear the paper hats, blow the plastic whistles, and tell the silly jokes. Uber Mist from our Unexpected Beauty skincare. I never knew what a mist was and now I can’t be without it. What is your favorite hostess gift to give, and the best hostess gift you’ve ever received? Right now I like things from our Lasting Legacy collection. Catchalls, Coasters and Notepads with letters from the geographical alphabet created by my father, David Hicks that I’ve made my own. The best hostess gift was when that same Nathan Turner and his partner Eric Hughes arranged a boatload of hydrangeas I had sent from Nassau for a party David and I were throwing. I was deathly afraid they were going to turn up dyed blue. A quiet hour each day. Exercise. And I do like a good bath. Teleportation. So much better than airports. A fitted dress with something interesting going on like lace or cutouts and a good pair of high heels – but that’s not for the every day, the every day look is flip flops and jeans….very uninspiring for David, who hoped he was living with Grace Kelly. Keep up and enable the 5-second delay.